The most authoritative text for technical mathematics is now better than ever! Completely revised and updated, this new edition of a classic best seller provides the algebraic, geometric, and trigonometric concepts essential to solving problems commonly encountered in technical and trade occupations. 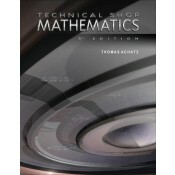 Technical Shop Mathematics begins with a review of arithmetic followed by elements of measurement, algebra, graphing, geometry, and introductory trigonometry. Clearly written practical explanations, problem solving techniques, examples, and exercises are provided throughout with emphasis placed on applications—making it an ideal textbook for lecture courses or a resource for guided self-paced study. It has become a standard on-the-job reference for shop professionals. • Contains large, easy to read two-color formatting with logical sequence of topics. • Provides clear explanations that build on the strengths that have made this book standard for more than 25 years. • Includes graphing linear and trigonometric functions—an intuition building skill needed for many technical trades, but rarely offered in similar references. • Presents sufficient material for two standard lecture courses or for an intensive one-semester course.